Reproduction or use, without express written permission from Tandy Corporation, of any portion of this manual is prohibited. While reasonable efforts have been taken in the preparation of this manual to assure its accuracy, Tandy Corporation assumes no liability resulting from any errors or omissions in this manual, or from the use of the information contained herein. Popular pinball folklore has it that in prehistoric times two cavemen, Og and Grog, were sitting around the fire, both fat and happy after feasting on dinosaur burgers, thinking of ways to entertain themselves till their spouses returned from a club meeting. Suddenly, in a moment of inspiration, Og seized a boulder and shoved it with a stick at a herd of pinosauruses grazing in the tribe’s playing field. The boulder struck one pinosaurus and ricocheted into another. "Twenty points!" said Og looking at the reactions of some observers, twenty of whom were pointing at the spectacle. "Now it’s your turn." Grog scratched his head in thought. Then he grabbed another boulder and sent it toward the pinosauruses. The boulder struck one then ricocheted off a nearby bumpersaurus, into a second pinosaurus, and finally into a third. "Thirty points!" howled Grog gleefully as he scanned the impressed observers. The two experimented with various strategies for hours. Grog noticed that whenever Vally (their pet dinosaur) swallowed a fly at the precise moment a boulder struck a pinosaurus, the great volcano would erupt. When this happened Og exclaimed, "Now Grog get ten times score." Thus pinball (a shortened version of pinosaurus boulder ball) was born. 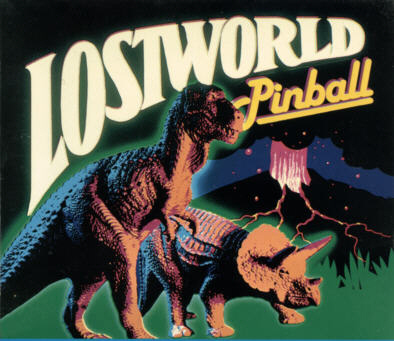 Now you can experience the thrill and excitement Og and Grog had on that historic day with Lost World Pinball. Editor’s Note: Certain experts have questioned this explanation of the origin of Pinball. Set up and connect the Micro Color Computer (MC-1 0), 16K RAM pak, color video or television, and CCR-81 cassette recorder or equivalent following the instructions in the TRS-80 Micro Color Computer Operation Manual. Then follow the instructions below. 1. Turn on the television, and set the volume at a normal listening level. Select channel 3 or 4 (whichever is weaker or not used in your area). 2. On the MC-10, select the same channel by positioning the CHANNEL SELECT switch (on the bottom of the computer) to the appropriate setting. 3. Set the antenna switchbox to the COMPUTER position. 4. Turn on the computer. The POWER ON/OFF switch is on the right side of the computer. v.r is a pair of numbers specifying the version and release you have. 5. Place the Pinball program tape into the cassette recorder. Set the volume of the recorder between 5 and 7. 6. Rewind the tape completely. 8. Press the PLAY button on the recorder until it locks. The letter S appears in the upper left corner of the television screen while the computer searches for and loads the program. When the computer has found the program, the letter F and the filename appear at the top of the screen. 10. The title screen appears. Press the space bar. The game appears on the screen. The left flipper is controlled by the [CONTROL] key. The right flipper is controlled by the [SHIFT] key. To launch the ball, press [ENTER]. This depresses the ball launcher. The ball’s velocity is determined by the depth to which you depress the ball launcher. When you release the [ENTER] key, the ball is launched. If you hold down [ENTER] too long, the launcher resets at the top. Release the [ENTER] key, and start the process over. You receive an extra ball for each 10,000 points scored. When a plunger is hit, it turns green and cannot be scored again until it is reset. When all plungers are hit during the play of one ball, they reset, and all subse­quent scores are doubled. "2X" appears to the right of the playing field when scores are doubled. If you hit all the plungers while the 2X is in effect, "3X" appears, and all subsequent scores are tripled. When one ball’s play ends, the playing field is reset, and scoring returns to the original values. The next ball appears on the launcher. To make the volcano erupt, the dinosaur has to catch the prehistoric fly with his tongue. To get the tongue to reach the right length, you must hit the red marks set up by the top four plungers twelve times. The tongue length accumulates during an entire game and is not reset at the end of one ball’s play. The ball you are playing disappears when the volcano erupts, but reappears ready to be re-launched. Any points you get with it are now at ten times their regular value, "10X" appears to the right of the playing field. To reset the game during play, press the [BREAK] key. The title screen reappears. Press the space bar to begin a new game. When no balls are left, the game ends. The end of the game is signalled by the high score board flashing. The highest score for a game played since the program was first run is displayed on the high score board. Press the space bar to begin a new game.